This case study details the story of Moyra Hyndman’s horse injury and recovery (told in her own words)using Botanica’s wound treatment products. On the 7th June I went to pasture about one mile from my house. My intent was to bring in a horse and bring it back to work.The horse has a very infected huge cut on her off-hind canon area. We were not sure what caused the injury, but it was horrific. There was a large area of outer skin missing and the infection was so bad, that as she walked it oozed out and ran down her leg. The horse was treated by our vet, the wound was treated and bandaged, and the horse was put on a strong course of antibiotics. The horse had to be sedated by injection before the vet could touch her leg. As time went on, the vets tried various methods of clearing the infection. The horse visited the vet twice weekly for ten weeks and had to be sedated by injection each time. There was slight improvement on the cut, but the horse was becoming more difficult to load onto the trailer and we felt that she was becoming dull and not recovering as quickly from the injections.By this time our vet’s bill was huge and there seemed to be no end in sight. I was desperate. Then some hope came when a man told me to visit a stand at the Dublin Horse Show. Gladly, I headed for the show and sought out the ‘Botanica’ stand. I met and talked with Sean Cooney, and he introduced me to Botanica Cream and Botanica Cleansing Wash. I spent about 40 Euro and headed home. One of the things I was worried about was how I would even get near to my horse and touch her leg without sedative injections, let alone wash it and apply cream. Sean gave me some advice on how to gain her trust, and assured me that the cream would work. The next day, my husband and I took off the bandage, cleaned the wound and began to apply the cream. Sean was right! 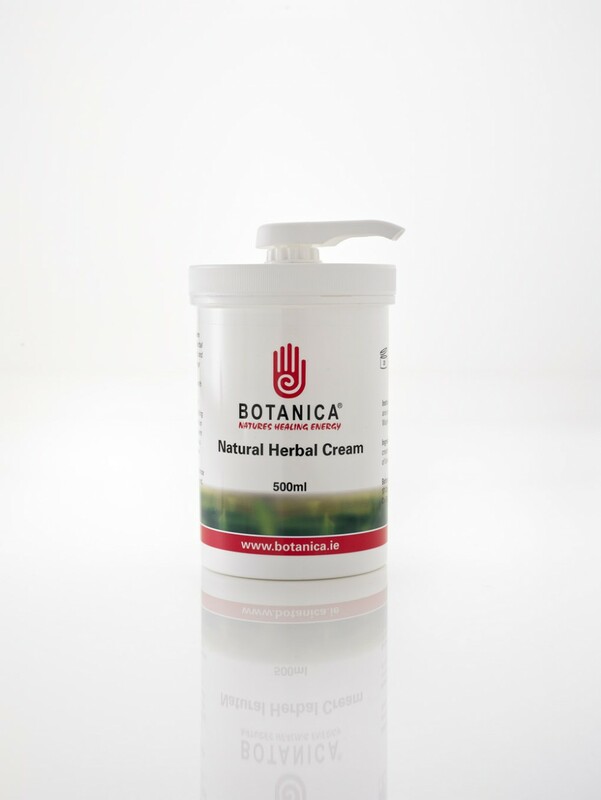 The Botanica cream seemed to have a soothing effect and within a few days we were able to apply it easily.Thankfully the improvement was steady and now the wound is almost completely healed. I am indebted to Sean Cooney and his wonderful medicines. I also value his knowledge and advice on horse behaviour patterns. I am looking forward to bringing my horse back into work and I can assure you my tackroom will always have a jar or two of Botanica Cream in it.